After nearly 4.5″ of rain in parts of southeastern Connecticut the heavy rain has come to an end. Here’s a look at some of the rain totals across the state – many of which are quite impressive! The rain was focused along a warm front that managed to sneak into southern Connecticut. The winds were out of the south and east in Groton, Westerly, and Westhampton Beach while Providence, Willimantic, and New Haven had northerly winds. An impressive theta-e gradient as well with mid 50s for temperatures and dew points in Groton and low 40s elsewhere in Connecticut. 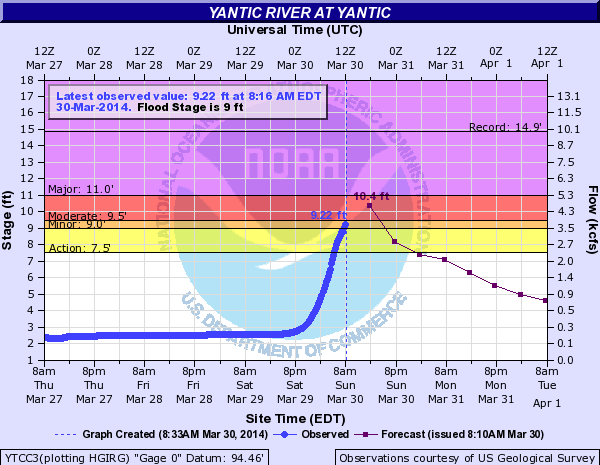 The Yantic River managed to reach moderate flood stage with 4.5″ of rain through the basin while other rivers in northeastern Connecticut reached minor flooding benchmarks. Not a surprise to see minor flooding given the setup with a strong low level jet on top of a stalled warm front near the south coast. A nice surge of high precipitable water air moved in overnight all in a region of strong quasi-geostrophic ascent and even a bit of elevated instability. Classic “sultan of sandbag” signal for southeastern Connecticut, Rhode Island, and southeastern Massachusetts. An area of training thunderstorms this morning put down nearly 4.5″ of rain in Salem over the course of 2 hours. An unstable atmosphere coupled with a weak area of convergence just north of the Sound lead to an impressive burst of Monday morning rain. Here’s the doppler radar estimate for precipitation this morning. The yellow is >2.5″ of rain and the red is >3.5″ of rain. Our spotter in the southern part of Salem reported 4.5″ of rain. While that was a lot of rain in a short period of time we didn’t receive any reports of serious flooding. The biggest reason was that the area of heaviest (4″+) rain was relatively small geographically. 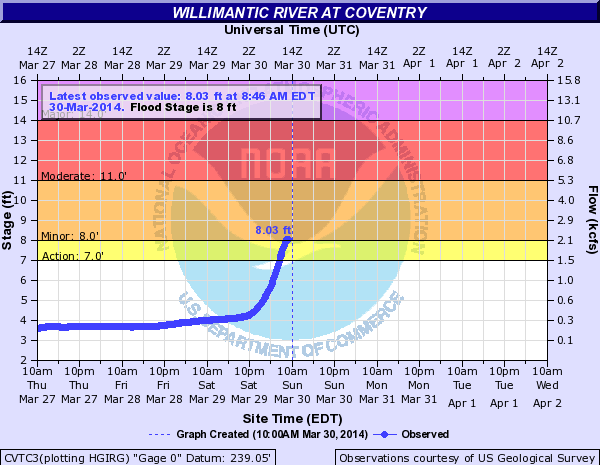 Here’s the river stage hydrograph on the Eightmile River on the East Haddam/Lyme border. While the spike is impressive it’s well short of the record stage of 11.12 feet from June 1982 or even other high crests in the last decade. 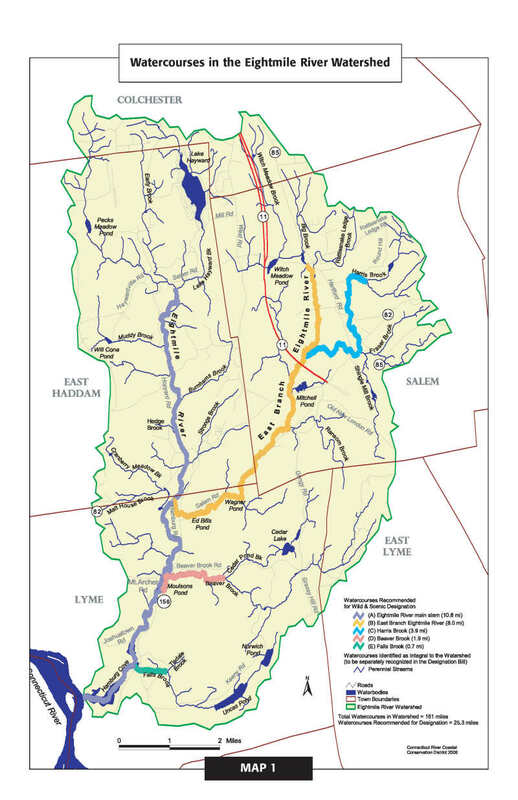 This map of the watershed from eightmileriver.org shows why the flooding on the Eightmile wasn’t more substantial. The river gauge is located on the main stem just upstream from the confluence with the east branch. The water flowed through the gauge had run off from all of the eastern half of East Haddam and the southern part of Colchester. While over 4″ of rain likely fell at the gauge site itself most of the watershed upstream of the gauge saw substantially less rain – on the order of 1.5″-3.5″. 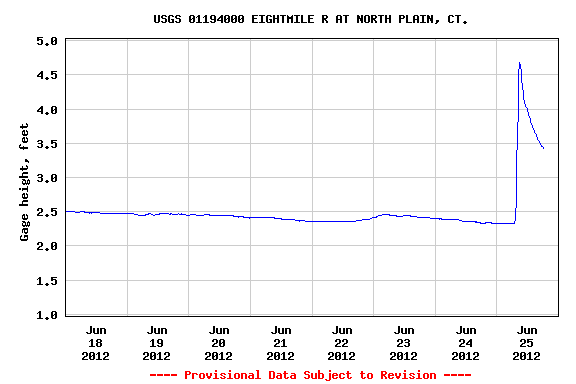 Had 4.5″ fell across the entire basin upstream from the gauge at North Plain the flooding would have been more significant. When predicting flooding in a given location on a river it’s all about how much rain has fallen in an entire basin – or at least the portion of the watershed upstream from you! For example, in the March 1936 Connecticut River flood there really wasn’t any notable amount of heavy rain or snow melt in Connecticut. All the rapid run off was upstream in New Hampshire and Vermont and that was enough to push the Connecticut River well out of its banks and through the city of Hartford. If you take a look at those years a lot of the years jump out. With the exception of 1920 and 2008 most of the wettest years on record have seen, not surprisingly, tropical activity in or near southern New England. In 1972 it was the remnants of Agnes. In 1955 it was the remnants of Connie and Diane. In 1938 it was the great hurricane. In 2005 it was the remnants of Tammy. In 2011 it was Irene and the remnants of Lee. The last 2 1/2 months have been incredibly wet. October so far is 2.25″ above average while September was 5.77″ above average and August was 7.74″ above normal. With another major rainstorm on the way for Wednesday we’ll easily tack on another inch or two to the 2011 total. On average we pick up 9.65″ of rain in the last 75 days of the year which means that if from here on out we pick up exactly normal rainfall we will break the all-time wettest year record.